you get a lot of headaches. Astigmatism can cause fatigue if you are concentrating for a long time on a visual task like reading, using the computer, or driving. Your focusing system is constantly adjusting, trying to achieve a sharp image, which your eye simply can't produce. You may get tired, or have headaches at the front of your head if you squint a lot to try to see more clearly. This makes the muscles in your eyelids and face uncomfortable. If you have any of the symptoms listed above see your optometrist for an eye examination. This will show what's causing any vision problems, including astigmatism. 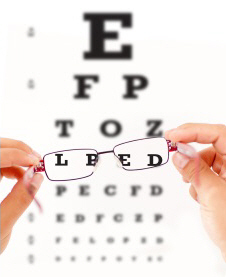 It's best to have regular eye exams to make sure your eyes are healthy and you can see clearly and comfortably. Have an eye examination every two years after the age of 40, unless your optometrist or ophthalmologist suggests otherwise. After 65 you may have them more often so your optician can diagnose and treat any sight-threatening conditions, such as glaucoma and age-related macular degeneration (ARMD) as soon as possible. On the next page: How is astigmatism treated?